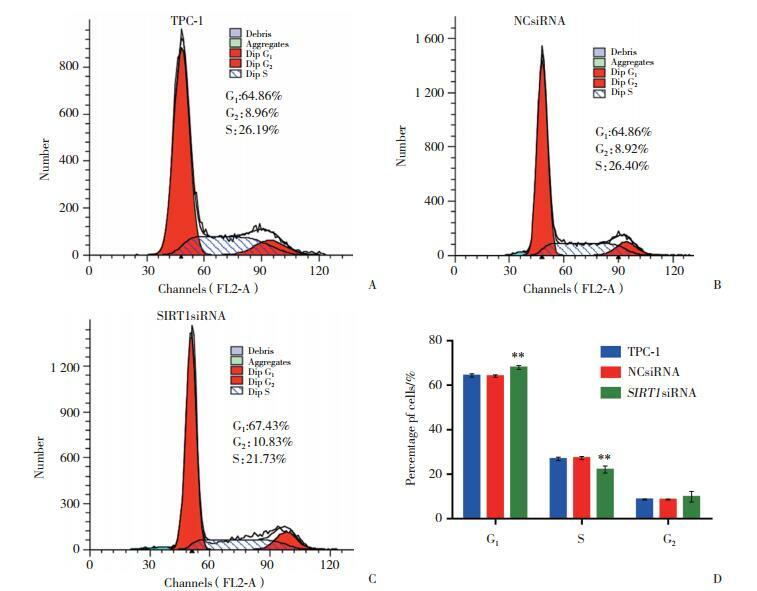 Abstract: Objective To investigate the effect of silencing SIRT1 on the biological behavior of the human thyroid papillary carcinoma cell line TPC-1.Methods SIRT1 siRNA was used to downregulate the expression of SIRT1 in TPC-1. The interference efficiency of siRNA was detected using qRT-PCR. The siRNA with the strongest interference efficiency was selected and the expression of SIRT1 protein was verified by Western blotting. 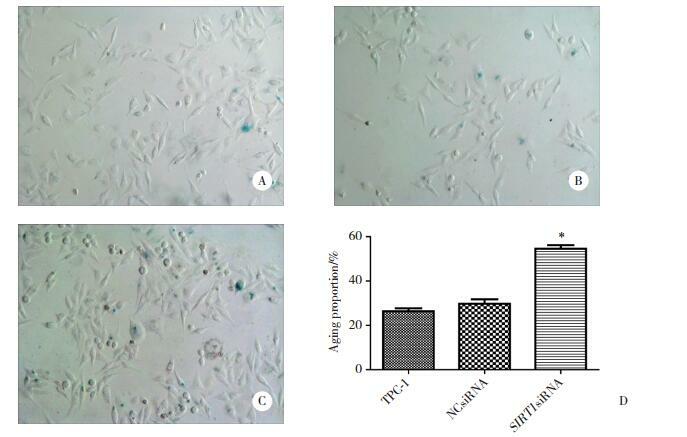 The inhibitory rate of proliferation, senescence, apoptosis, and cycling of transfected cells was detected using the CCK8 method, β-galactosidase staining, Hoechst staining, and flow cytometry, respectively.Results The SIRT1 expression in thyroid papillary carcinoma cells transfected with siRNA was lower (P < 0.05) than that in the untransfected cells. 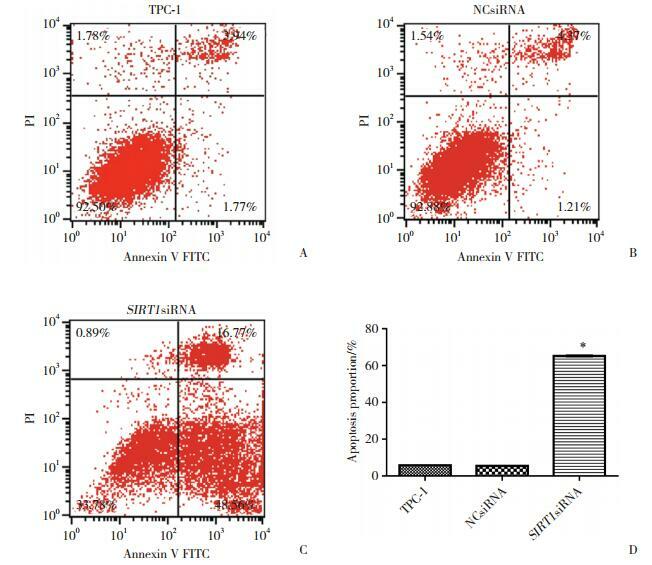 The proliferation of transfected cells was significantly inhibited (P < 0.05) and their proliferation rate was lower than that of untransfected cells (P < 0.05). The proportion of aged cells and the percentage of apoptotic cells in the transfected carcinoma cells was significantly increased (P < 0.05). 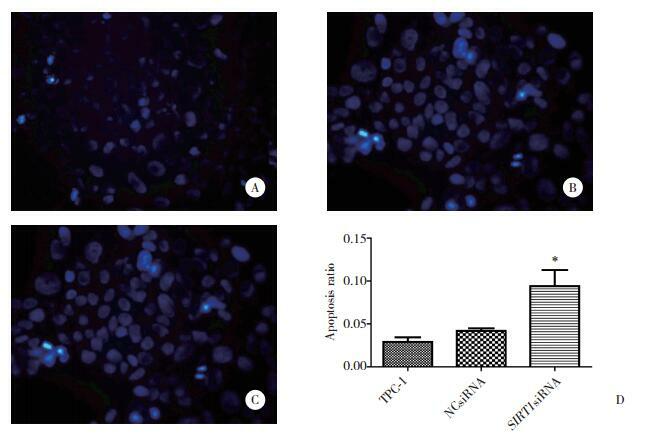 The transfection of SIRT1 siRNA increased the number of cells in the G1 phase (67.99%±0.87%, P < 0.05).Conclusion Reduced SIRT1 expression in the human thyroid papillary carcinoma cell line TPC-1 can inhibit cell proliferation, block the cell cycle, and induce cell senescence and apoptosis. HATTORI Y, IHARA M. SIRT1[J]. Nihon Rinsho, 2016, 74(4): 589-594.